The weekend before Thanksgiving we attended the Chicago Toy & Game Fair. It was our very first experience attending an event like this and the verdict? Very cool. We’re pretty serious about play around here, so having some of our favorite toy and game makers under one roof is a big deal to us. We were also excited to discover new things that are destined to make The Risky Kids play list, and discover we did! 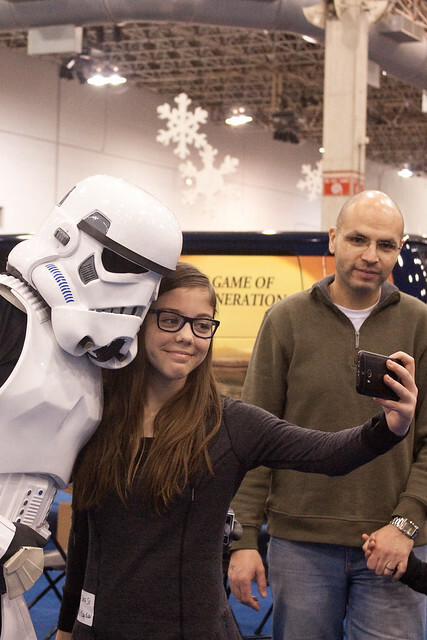 Here are the coolest things we saw and played with at the 2014 Chicago Toy & Game Fair. Razor Power Rider 360 : I would say that our Razor scooters would be top contenders for The Risky Kid Toy Hall of Fame. The kids have gotten some serious use out of their scooters. After giving the Power Rider a spin, they’re ready to clear a space next to their scooters for this puppy. 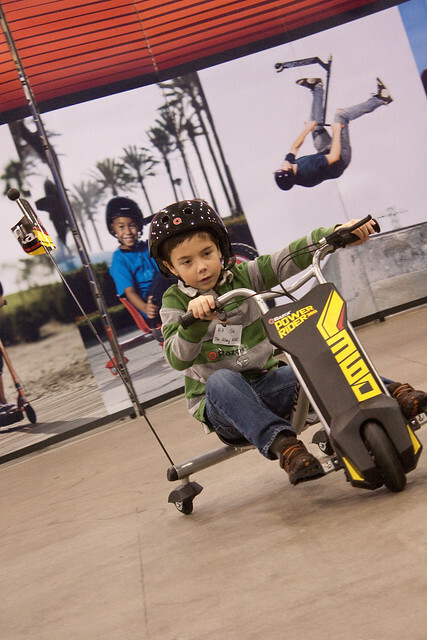 I used to be against making toys that were originally body-powered into electric versions … but after seeing the glee on the kids’ faces when riding this, I had to re-evaluate. The more I think about it, if it gets kids outside (especially older kids and tweens)? Then I’m all for it. 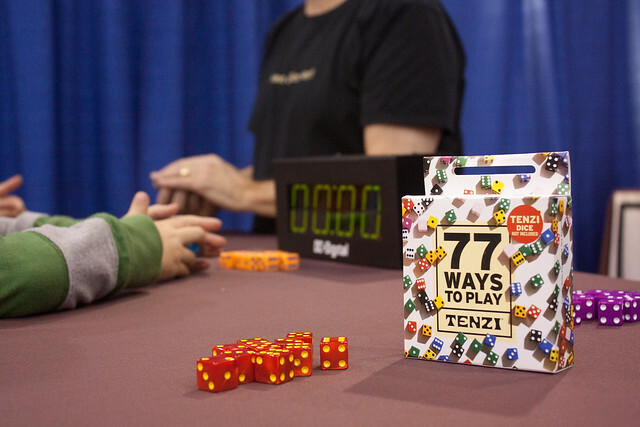 77 Ways to Play Tenzi : We love Tenzi, and have played every version that comes with the game many, many times. Did you know you can buy this deck of cards to expand your Tenzi play possibilities? We didn’t! But guess what came home with us? This is a great game for a wide age range of kids (and adults!). While you can’t play it while traveling, we like to take it on trips with us because it barely takes up any room. OGOBILD Kit Pod and OGOBILD AnimateIt! : Both from OgoSport, a brand we absolutely love. I wish I had pictures to show you, but we were too busy playing! Elena got excited about both of these, and when the tween gets excited about a toy? You better believe I notice. The OGOBILD Kit is a construction set you can use to build forts, balls, and whatever else you can imagine. The cool part is how flexible, lightweight, and yet sturdy it is. We bought a similar product from another brand last year for the same amount of money and it frustrated the kids SO much. It was always toppling in on itself. Not this kit. It would be fun indoors for winter and just as exciting outdoors for summer fun. OGOBILD AnimateIt! is a kit that teaches kids how to make stop-motion films, giving them fun construction parts to make kooky designs. You can buy the kit with or without a camera. The software that comes with the kid was designed by the same folks that brought us Wallace & Gromit and Chicken Run. Tapple : This game was totally new to us, but it’s officially on our Christmas list. The letters of the alphabet are arranged around a timer button. At the start of each round, a card is drawn with a topic, such as “Names of Cities.” The first player hit the timer button, then taps down a letter and names a city that starts with that letter. The next player hits the button to restart the timer and does the same, only he can’t pick the same letter. Once each player has a turn to name one thing, the first player goes again. Same topic, but this time you have to name two things – and you can only use whatever remaining letters haven’t been tapped! When all the of the letters have been used, you move on to the next topic card. If the timer goes off before you can name your things, you’re out. Last player standing wins. We really had fun with this one, and I can see families coming up with their own cards to keep the playability going. Magna-Tiles : I’m familiar with Magna-Tiles, but I’ve never actually seen them in action. To be honest, I’d kind of passed them off, as Eli was never really into building toys of any kind (other than LEGO). But he was drawn to the booth, and the young guy manning the booth was SO good with him. We ended up spending over half an hour at the booth, with Eli building the entire time. What’s cool about the Magna-Tiles is how strong they are. As long as you balance your creations, you can build as high as you want (or until you run out of tiles)! 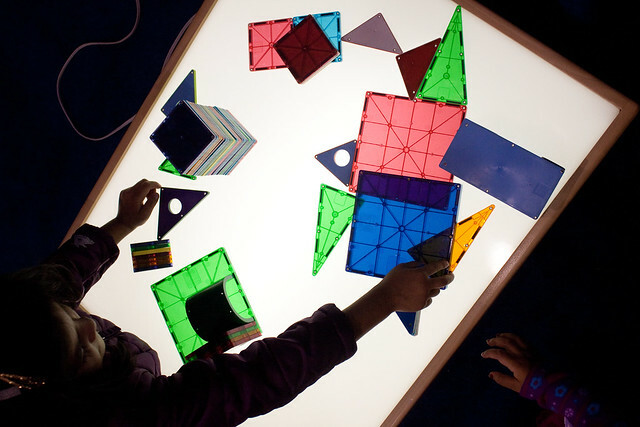 The younger kids really got into playing with the translucent Magna-Tiles on the light table. They are pricey, but everyone I’ve talked to that has them (and there are lots of you that are fans on my social media pages) swears that they are worth every penny. One mom that stopped by the booth said she’d purchased them for her 2-year-old daughter. She’s now 12 and she still plays with them! 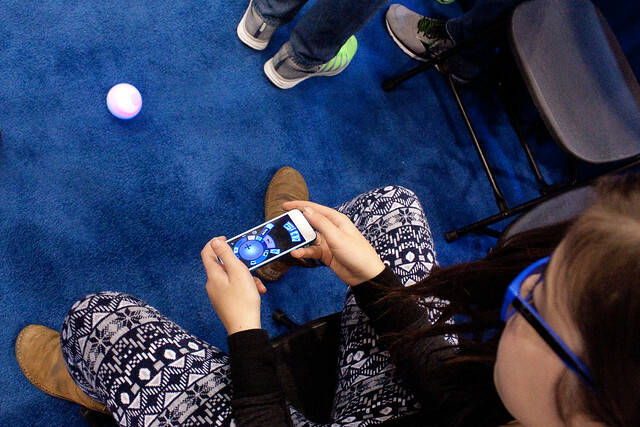 Sphero 2.0 : We tried out both the Sphero and the Ollie (you can compare them here). They’re both app-controlled robot toys. The kids had trouble figuring Ollie out in the few minutes they were able to spend with him, but they both got Sphero up and rolling right away. You can complete challenges and do tricks with Sphero, but the really cool part (in my mind) is that kids can learn basic programming while they play with Sphero. We’re really curious to test the claim that Sphero is pet-proof! 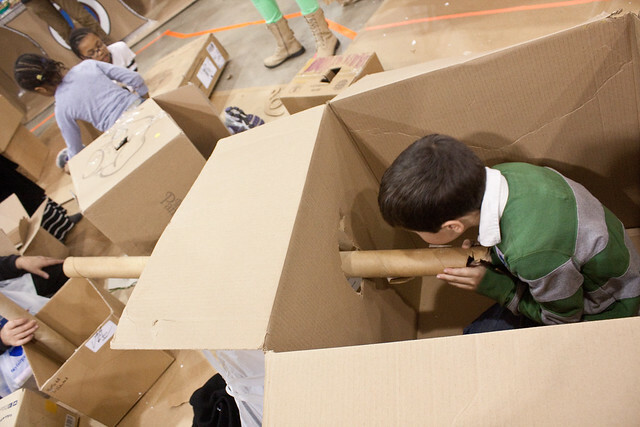 Cardboard Playground: So this wasn’t an actual game or toy that you can purchase anywhere, but it is something that anyone can do anytime, anywhere! This fun little corner of the Fair was put together by Adventure Sandwich. It was cool to see how the playground evolved as the day went on and kid after kid made their own unique cardboard creations. Eli made a tank, of course. Besides having a fun day as a family and discovering some really cool toys and games, the best part was meeting the people behind the play. Everyone was so passionate about their toys and games, and about making peoples lives more playful. These people were definitely my tribe! Check them out and add them to your holiday gift lists. You won’t be disappointed! What a cool experience. 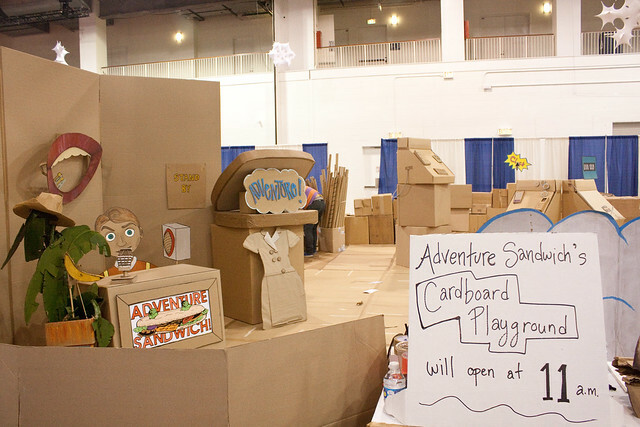 I LOVE the cardboard playground idea! With shipping boxes coming around this month, perfect way to re-use before recycling!